Something to Muse About: "X-Men: Days of Future Past" Review! 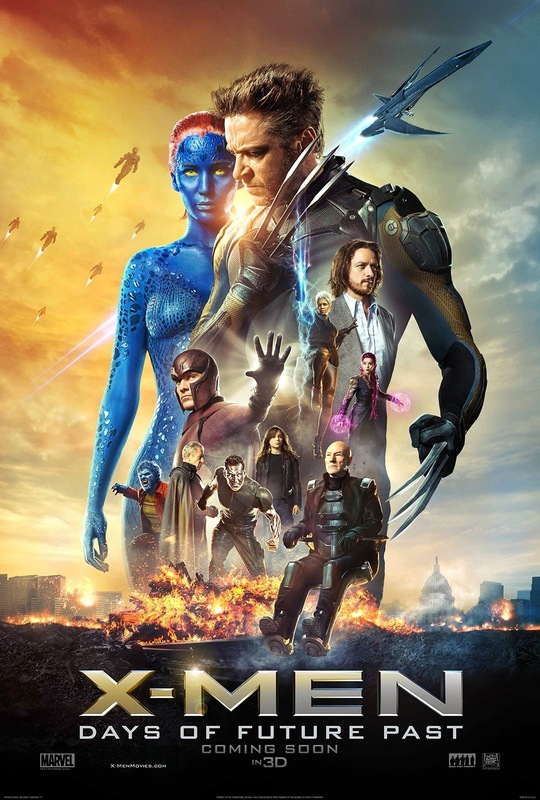 X-Men: Days of Future Past brings together characters from the original X-Men film trilogy with the their younger counterparts in what is sure to be one of, if not the largest blockbusters of the summer. In an apocalyptic future, we find both the human and mutant populations on the verge of extinction. In a Terminator-like fashion, one must travel back in time to change certain events in order to save the world from certain destruction. Following the trend of all of the films in the franchise, Wolverine remains the film's centre point and he is tasked with doing so, given his regenerative abilities will ensure that the journey alone doesn't kill him. Hugh Jackman has yet again risen to the challenge of transforming himself physically into Wolverine, but more importantly, we see him having to develop into more than just a hot-head with a severe existential crisis. In meeting a young Charles Xavier, among others, he must provide guidance and council to a man who has always been the one providing it to others. Jackman hits these new notes well, and it's a welcome evolution to the character. But if there were but one performance which I would commend above all others, it would be that of James McAvoy. This Xavier is one vastly different from the sophisticated gravitas of Sir Patrick Stewart and also from the rambunctious flirt seen in First Class. Here, we see Xavier as a self-medicating addict in the 1970's (complete with a terrible hairstyle and heinous outfits). McAvoy's performance holds the intensity and raw depth not often seen in blockbusters, but more so in smaller films that remain largely unnoticed until they come up from behind and sweep the awards shows. In one scene, we see both Xaviers meet and much to McAvoy's credit, he steals the scene which is not an easy task when face-to-face with the likes of Sir Patrick Stewart. The sheer scope of this film is incredible. It's evident that the budget was massive and all of that money was well spent. From special effects, to the costumes and make-up, everything about this film is visually strong. There's not one stand-out villain in the film because the characters and story demonstrate the blurring of morality where war and politics are concerned, as can be seen when simply looking back throughout history. The standout sequence is that of Quicksilver's, although the blaring scientific inaccuracy of his listening to music whilst travelling faster than the speed of sound is cringe-inducing. Putting that aside, the rest of the sequence seems to have been inspired by films like Inception, with its creativity and attention to detail. Evan Peters also delivers solid comedy to the role and both he and the character have become fast fan-favourites. The only weak point of the film is the fact that with so many characters present, not everyone gets fully utilised or developed in the story. It's understandable, as doing so would likely result in a 40-hour film. But given the success of the back and forth in the Marvel Cinematic Universe of stand-alone films for certain characters before reuniting as a group in the Avengers films, as well as the Wolverine films in the X-Men film franchise, one can only hope that more characters will get stand-alone films. Not only does it allow for greater character development often only obtained on television programs, I for one would like to see a stronger presence and utilisation of the POC X-Men. How is it that Halle Berry hasn't had a Storm film yet? The woman won an Oscar; she could handle leading a blockbuster just fine.